Melanie is back from her sister's place. 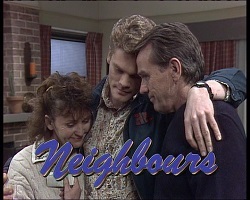 She greets everyone and then Joe tells her that Simon came round and he was forced to tell him about their relationship. Melanie says she'd better speak to him about it. TOBY: What's his problem, anyway? He missed out - tough. Joe explains to Toby how Simon feels - he's entitled to be upset, just as they would be if Melanie dumped then. He nods in understanding. They look at the map to see where Madge and Harold are going in their trip. 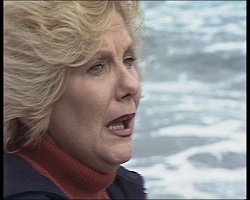 Melanie comes back in - she's rung Simon and they're going to meet up in the morning. Madge and Harold are very much enjoying the freedom of the road. Harold starts singing "I'll take the High Road"! Gaby is trying to talk Adam round about Glen, but he won't be moved in his opinion - he thinks Gaby can do a lot better. Doug tells Pam that he wants to give Adam a really good send-off tonight, but Pam has to work. Doug is very unimpressed and tells her to swap shifts. Simon comes round to see Melanie so Joe ushers the kids out. Melanie apologises for not telling him the score, but Simon says he won't make any trouble. But he can't believe that Melanie has fallen for Joe. His only question is, how long can it last? He thinks Melanie and Joe's relationship is a holiday romance. She hands him the ring. SIMON: This is the rest of your life. This is Joe's life, and the kids. You need to be very, very sure. And you're not, are you? Gaby is worried because they're only made one sale all day. Pam calms her down. Doug comes in and Pam tells him that she's managed to swap shifts. Gaby tells Glen that she shouldn't have shouted at him last night - maybe they could get to know each other a bit better. Glen doesn't think so though - some people are "chalk and cheese". Joe has come home to see Melanie with some flowers. Melanie is very upset about what Simon said to her. Joe reassures her. They chat it over and they tell each other that they love each other and have a bit of a kiss. Harold has been to the post office and on the way back he sees a policeman inspecting their campervan. 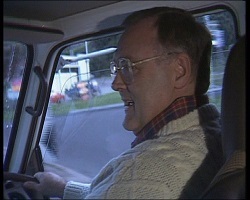 The policeman demands that he opens the van as campervans are often used for tranporting drugs. Then he starts searching Harold's person! MADGE:(to the policeman) Why are you doing this?! 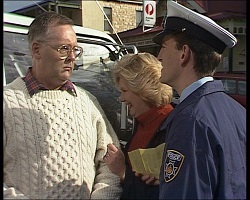 Harold is outraged, but Madge laughs - it's not a policeman after all, just a comedy telegram. Melanie answers the door - it's Simon again. He's come to ask her again if the wedding's really off - he has to tell his parents. MELANIE: Yes, Simon. Tell your parents that I'm really, really sorry but I'm asking to cancel. MELANIE: Simon, I have thought really, really hard about it. And it isn't a holiday romance. I'm so sorry to have hurt you. But to go ahead now would be wrong for everybody, especially for you. SIMON: You're absolutely certain then? MELANIE: Simon, you are a fantastic guy. And I'm sure you'll find the right girl. But she's not me. Simon tries not to cry. 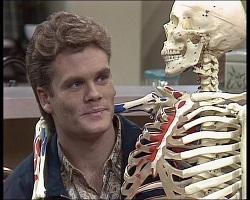 Adam is packing up his stuff, including his skeleton. PAM: We're going to miss you. Doug comes in and tells Adam he's organising a takeaway for him, but Adam is booked on a train in two hours. He's put his car into Pam's name so she can use it to run back and forth to the hospital. Pam is very grateful and hugs him. ADAM: And Dad? Thanks. Thanks for everything. 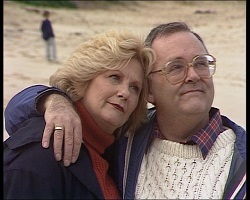 Madge and Harold are walking along the beach in a good mood. Harold has cheered up a lot. 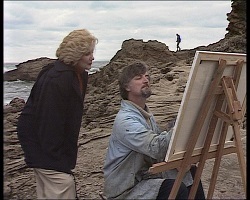 They pick up shells and Madge goes over to talk to an artist. 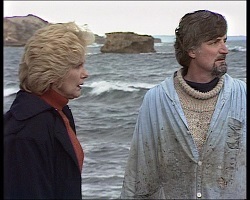 Harold heads off to the rocks to pick up some more shells, Madge warning him to be careful on the slippery surface. HAROLD: Oh, Madge, would you smell that air? Do you know something? HAROLD: Communing with nature. I'm sure it brings you closer to God. 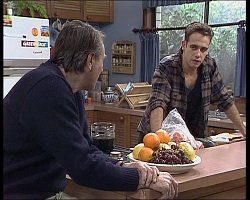 Doug chats to Glen about Gaby. He thinks he might have made a mistake in fobbing Gaby off and might ask her to go out after all. Pam is crying into a tissue when Gaby comes home - Adam has gone. Gaby has sold a dress, four skirts and two tops. Pam says they're going to go out to Adam's leaving dinner anyway and thinks Gaby should invite Glen. Gaby rolls her eyes and says that Glen turned her down earlier, so she'd rather not. GABY: The guy is a pig. End of story. Melanie is lost in thought about Simon. She tells Joe how guilty she feels. TOBY: (whispers to Joe) Why don't you do the right thing, Dad? TOBY: Ask Melanie to marry you! JOE: Toby! I think that's between me and Melanie! TOBY: We're all in this together. Aren't we, Bouncer? JOE: Give me a break, Toby. TOBY: You're interested, aren't you? JOE: Of course I'm interested! 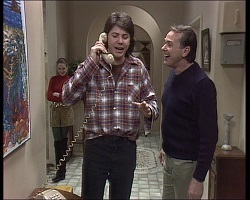 Joe calls over to Melanie. JOE: Hey, Mel! How about we get spliced? JOE: So, I'm pathetic! Just leave me alone, you're embarrassing me! Toby wanders off and a silence descends. A look comes over Joe's face. JOE: Mel...you know that I, uh, love ya, don't you? JOE: Really love you. Would you do me the honour of being my wife? JOE: What do you reckon? MELANIE: I'm sorry, the answer's no. MELANIE:(happily) Of course I'll marry you, you great big dummy! MELANIE: Of course I will! JOE: Don't you ever scare me like that again! 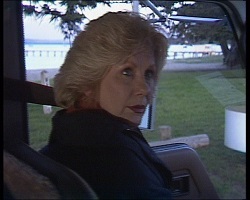 MELANIE: You know, Madame Zolga must have been way off beam with this one. Nothing bad could ever, ever, ever happen now! Madge is chatting to an artist about his work. 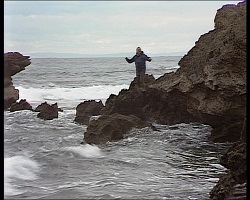 She waves to Harold who is on the rocks in the background, collecting shells. MADGE:(to the artist) He's enjoying himself. 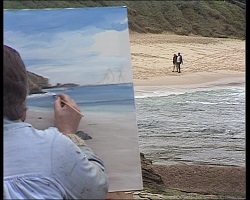 They chat about Helen's work and the artist offers to sell Madge his picture for $200! Harold is still on the rocks. ARTIST: $150, package and postage home included! MADGE: Oh...I'll have to ask my husband. She turns, but Harold is no longer on the rocks. MADGE: Oh, where's he gone? He was there a moment ago. ARTIST: Yes, I saw him. ARTIST: That swell can be dangerous at times. MADGE:(laughing) Oh no, don't be ridiculous, he's there somewhere. She goes to look, and the artist follows. 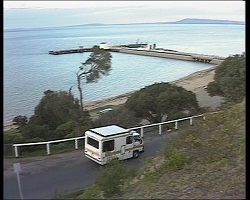 They go to the top of a rise and start their way down to the rocks where Harold was last seen. There is no sign of him. ARTIST: I'll phone Search and Rescue. MADGE: No, no, no, he's alright, he's here somewhere, he has to be. The artist ignores her and runs off. 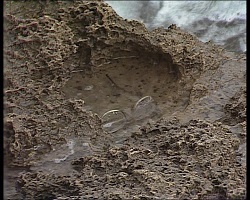 Madge bends down and sees Harold's glasses, fallen into a rock pool. She fishes them out and looks at them in horror. MADGE: HAROLD! Answer me, love! HAROLD! HAROLDDD!! !